NASA managers have ruled out putting a crew on board an Orion capsule atop the agency's huge Space Launch System rocket for the gargantuan booster's maiden flight in 2019, citing technical risks and higher costs, up to as much as $900 million, agency officials said Friday. Earlier this year, the Trump administration asked NASA to look into the possibility of either adding a crew to Exploration Mission 1, EM-1 for short, or moving up the launch of EM-2, the flight NASA already earmarked for the SLS booster's first piloted mission. That flight is targeted for launch in the 2021 timeframe. The NASA study concluded that while it would be possible to upgrade the Orion spacecraft to accommodate a crew for the EM-1 flight -- equipping it with life support systems, crew displays, a validated launch abort system and other critical elements -- it would have required an additional $600 million to $900 million in funding. And there would be additional technical risk and likely delays to accelerate software development and to retrofit the EM-1 Orion capsule to support a two-person crew. As a result, acting NASA Administrator Robert Lightfoot said agency managers and White House officials agreed it made more sense to stick with the original plan, launching an uncrewed Orion capsule atop the first SLS booster in 2019, followed by a piloted mission using an upgraded version of the rocket two years later. "At the end of the day, we found it technically feasible to fly a crew on EM-1 as long as we had a commitment of additional resources and schedule, and recognizing the technical risks we identified still were going to need a mitigation plan," Lightfoot told reporters Friday. "It really reaffirmed the baseline plan we had in place was the best way for us to go," Lightfoot said. "Leave EM-1 uncrewed." "It's really consistent with our available resources, and while it still has technical risk, we have a good handle on that and how an uncrewed mission will actually help EM-2 be a safer mission when we put crew on there." And so, NASA will stick with plans to launch a "Block 1" SLS rocket in 2019 to boost an unpiloted Orion capsule on a three-week flight beyond the moon and back to a high-speed re-entry and ocean splashdown. The launch date recently slipped from late 2018 to 2019 -- the exact date is TBD -- because of a variety of factors, including manufacturing delays caused by recent tornado damage at the Michoud Assembly Facility near New Orleans where the SLS rocket is being built. In any case, EM-2, featuring an astronaut crew, would be launched atop a Block 1B SLS rocket in the late 2021 timeframe. Unlike the EM-1 rocket, the Block 1B version of the SLS would feature a more powerful, human-rated "exploration upper stage," or EUS. The long-range plan is to use the SLS to send astronauts beyond the moon in the mid 2020s before eventual flights to Mars. The long gap between the SLS's initial test flight and the piloted EM-2 mission, driven in large part by NASA's budget and a variety of technical hurdles, has raised concerns in some quarters about maintaining public and congressional support in a program with years between flights and competing demands on agency funding. President Trump even joked recently, during a video chat with two space station crew members, about launching astronauts to Mars "during my first term or, at worst, during my second term." Lightfoot said Friday there have been no discussions with the administration about near-term astronaut flights to Mars. Just getting EM-1 off the ground will be difficult enough. The Government Accountability Office concluded last summer that NASA will have spent some $23 billion through EM-1 developing the SLS rocket, the Orion capsule and ground infrastructure. Putting a crew aboard would have driven that cost even higher. "We needed additional funding, and we needed additional time," said Bill Gerstenmaier, NASA's director of space flight. "We knew both of those had to be there, because we had certain components that just were not there. We didn't have crew displays, we didn't have an active abort system, we didn't have an active life support system. So we knew those had to get added in." In its initial configuration, the SLS Block 1 rocket will be made up of two shuttle-heritage five-segment solid-fuel boosters provided by Orbital ATK and a huge Boeing-built first stage powered by four hydrogen-burning RS-25 space shuttle main engines provided by Aerojet Rocketdyne. The Block 1 version features an interim upper stage derived from Boeing's Delta 4 rocket powered by a single hydrogen-fueled Aerojet Rocketdyne RL-10B2 engine. That upper stage is not currently human rated. 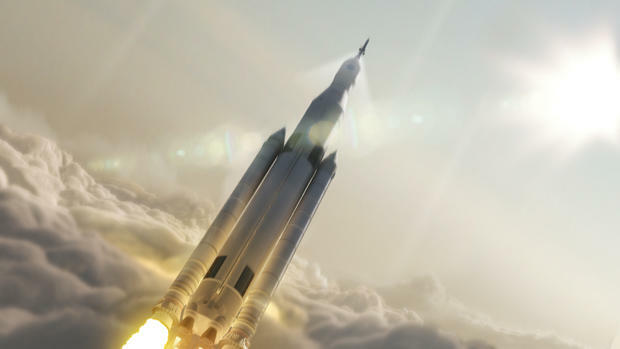 Even in its initial configuration, the giant SLS rocket will generate a ground-shaking 8.8 million pounds of thrust -- 15 percent more than NASA's legendary Saturn 5 moon rocket -- enough to boost the 5.75 million-pound rocket out of the dense lower atmosphere. Together with the second stage engine, the SLS Block 1 will be able to put 154,000 pounds into low-Earth orbit. NASA eventually plans to build a Block 2 version of the SLS feature advanced strap-on boosters with a liftoff thrust of 9.2 million pounds.